The Most Popular Flight in the World Is Not What You’d Expect - 24/7 Wall St. The busiest airline route in the world is a short hop of just under 185 miles between Kuala Lumpur and Singapore. There are eight airlines flying that route for a total of 41 flights a day. Between March 2018 and February 2019, more than 30,000 flights operated between the two cities, with about 73% of the flights departing and arriving on time. 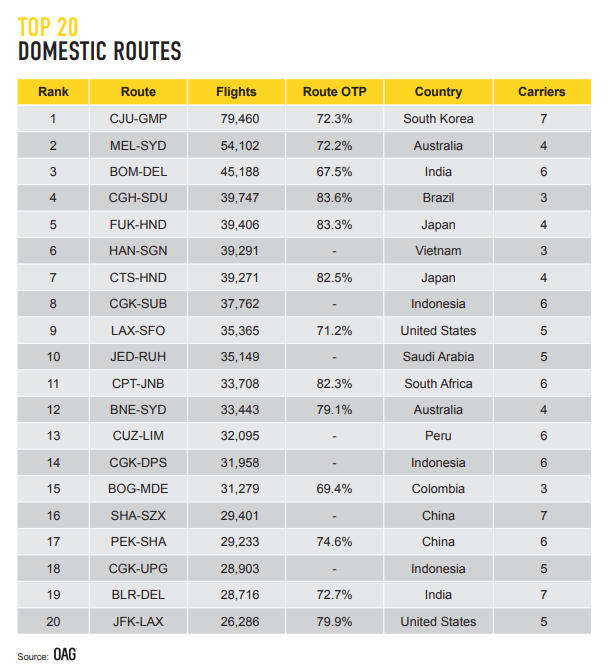 Of the world’s 20 busiest international airline routes, 15 fly between Asian cities, and the top six are all Asian routes. The seventh, between New York’s LaGuardia and Toronto’s Pearson International, is the only North American route to make the top 10. The only other non-Asian route is a flight between Dubai International and Kuwait International. The average number of seats on Asian international routes is 231, far ahead of the 171 seats on an international Latin American flight. Capacities on international flights average 165 seats in Europe, 131 in the Middle East and Africa, and 111 in North America. Competition is also keener in Asia, where an average of seven airlines operates on every route. In North America and Europe, the average is just three. Perhaps related to the lack of competition on routes is the on-time percentage of North American flights: a shiftless 55%. The data were compiled by OAG Aviation Worldwide, a data analysis and research firm, and the report on the Busiest Routes 2019 was published yesterday. The chart below gives the annual number of flights on the 20 busiest airline routes in the world listed by IATA airport code, along with the number of flights, the on-time percentage (OTP) for the flights on that route and the number of carriers flying the route. To help interpret the chart, here’s a list of the IATA airport codes by city. Eight of the 10 busiest long-haul routes operate inside the United States, with the busiest being between New York’s JFK and San Francisco, with four carriers making more than 15,000 flights annually between the two cities. The second-busiest route is between JFK and London’s Heathrow, with more than 14,000 flights a year. Another interesting point in the OAG report: Air Canada is the largest operator by capacity on six of North America’s 10 busiest international routes. U.S. carriers American, Delta and United operate three of the top 10 and British Airways flies the other one. The full OAG report is available on the company’s website.